At A2Z Carpet Cleaning Services, we take care of more than just carpets. 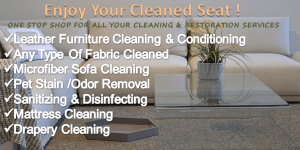 We also provide unmatched upholstery cleaning and restoration services at reasonable pricing. Furniture is used nearly everyday in most households, which is the main reason for routine cleaning and maintenance. Upholstery is made of different fibers than carpet, so the cleaning products used are not the same as our carpet cleaning solutions. We will inspect each fabric and utilize the best available solution to clean furniture.Upholstered furniture are well known to attract allergens, dust and dirt particles. Regular professional cleaning of these fabrics will ensure that you experience a safer, cleaner and healthier living environment indoors. Our experienced staff will first diagnose your furniture and recommendation the next steps and services required. Our wide selection of techniques allows us to clean everything from an outdoor lounge chair to a leather sofa. Here are the services we offer that will leave your upholstery spotless. Steam cleaning your upholstery can extend its life and leave it looking like new. This process involves blasting hot water/steam through the furniture to dislodge any dirt or debris from the fibers. We then vacuum the remaining moisture and dirt from the upholstery, leaving it immaculate. More delicate upholstery requires dry cleaning. We use top of the line products to clean your furniture without water. We then vacuum away any residue, resulting in pristine upholstery. This way you can bring us your furniture with fine material without worrying about damage. Shampoo/deep cleaning is great for furniture that requires a more serious clean. We apply shampoo and water to your upholstery and scrub the surface. This creates a thick foam and lifts any impurities to the surface. After we dry your upholstery, it is ready for you to enjoy. Different stains require different cleaning processes. Whether it be a stain from lipstick or coffee, we have you covered. We love our pets, but they can be very harmful to our furniture. Pets can create large stains that are difficult to remove and sanitize. Our professional staff can remove pet stains from your upholstery and neutralize any related odors. We work to clean up after your furry friends so you can live together harmoniously. We do more than improve the appearance of your furniture. 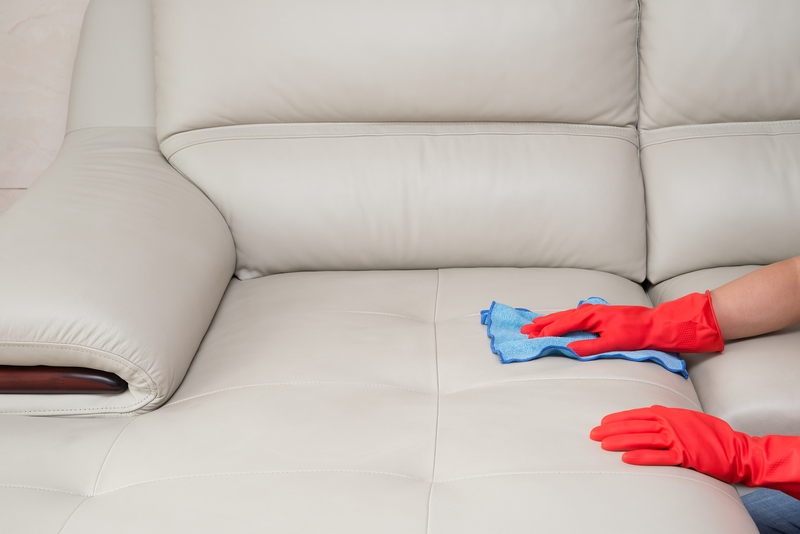 Our staff will perform a deep cleaning that will also sanitize and disinfect your upholstery. We work to ensure that your upholstery is clean to its very core. Scotchgard products are used to repel spills, stains, and liquids while preserving colors and fibers or your upholstery. This can prevent substances from sinking into your upholstery and prevent permanent staining and damage. After protecting your upholstery with Scotch Guard, we recommend our enzyme-based deodorizer. This non-toxic and gentle deodorizer is designed to attack odor-causing particles in your fabric. If mold and mildew accumulate in your upholstery, you may face potential health risks. 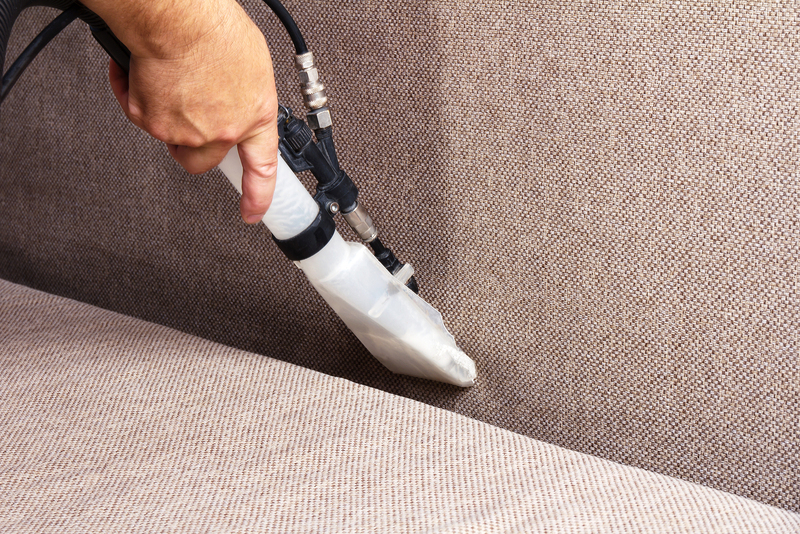 First we vacuum and brush your upholstery, bringing any mold and mildew to the surface. Then we remove the residue and apply high quality cleaning products, leaving your furniture mold free. Over time, body oils, perspiration, skin acids and regular wear and tear can tarnish the appearance of leather furniture. These substances leave dark spots or stains that require treatment. Our expert staff will clean your leather upholstery and apply a conditioner to restore it to its former beauty. First Step is to diagnose the problem areas and pre-treat them with the correct solution, our technicians apply our special upholstery cleaning solution to the fabric which loosens the embedded dirt. After we remove the dirt using our powerful extraction system, we recommend an application of Scotch Guard protection. This will help keep future dirt and spills from soiling your freshly cleaned surface. The third step is to enjoy your seat! A2Z Carpet Cleaning Services trained technicians use a hot water extraction system to loosen and clean the residue from your upholstery. Our gentle and effective cleaning system cleanses your upholstery and mattresses, without damaging your furniture or leaving behind chemical residues. We strive to restore your furniture to its original appearance. We will give your furniture a deep clean and promise to treat it with the utmost care. If you are looking for a professional & experienced Upholstery Cleaning company serving all of New Jersey contact A2Z Carpet Cleaning Services.